I love reading healthy living blogs and food blogs, and there is a vast amount of valuable information about how to live a healthy life. However, among the debates about organic foods and Crossfit, there is little discussion about people who do not have access to the tools and foods necessary for a healthy lifestyle. I say this not to trivialize typical blog topics (that’s mostly what I write about, too) but to suggest that there is room for broader discussion of healthy living challenges that most bloggers, myself included, do not usually face. My goal with this post and future social justice posts is to provide information and encourage people to contribute to change in their communities if the topic is meaningful to them. A food desert is an “area in the United States with limited access to affordable and nutritious food, particularly such an area composed of predominantly low income neighborhoods and communities” (US Department of Agriculture). (Low income areas are defined by more than 40% of the population having incomes at or below 200% of the federal poverty threshold.) Approximately 23.5 million people live in food deserts. 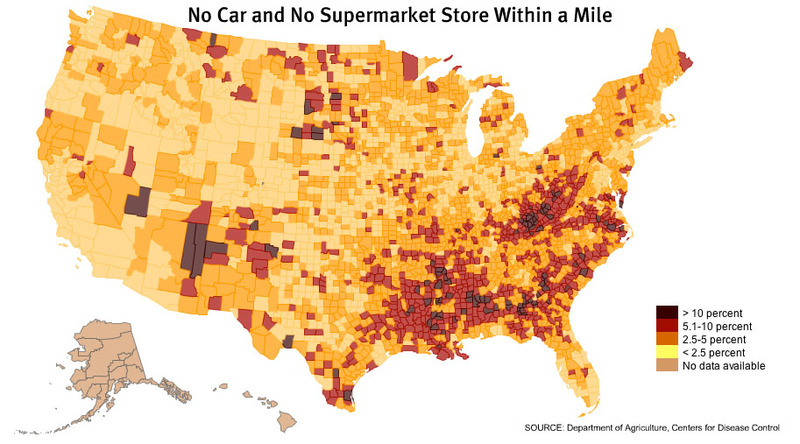 Food deserts are most common in urban and rural areas. What is a food swamp? Some people have suggested that food swamp is a better term for urban areas than food desert because there is usually food available, but it is not healthy, varied, or affordable (i.e. fast food and pricey, processed convenience store food). If everything goes right—the buses are on time and they make every connection—a one-way trip from their apartment to the store takes two hours. But if there’s a glitch, and there’s almost always a glitch, they’re looking at three hours. Each way. By car it takes twenty minutes to cover the same route. There’s another Kroger, half the distance from the one on Moreland Avenue. But the bus to get there is crowded. “No one gives up a seat,” Charles said. “We have to stand the whole way.” Forget the store five miles north in Vinings Village; MARTA service ends at the border of Fulton and Cobb counties. I highly suggest reading the rest of the article. While statistics are useful and important, I think reading about the human side of food deserts is most powerful. 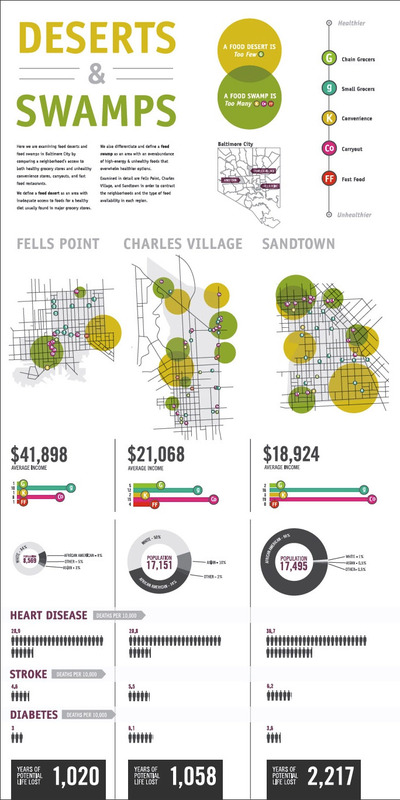 The infographic below depicts the location of large grocery stores vs. small grocers, convenience stores, carry out, and fast food in three geographic areas of Baltimore, Maryland. The population, average income, and racial makeup of each area is included. The bottom of the infographic shows the number of deaths/10,000 people for heart disease, stroke, and diabetes (which are all linked to diet) for each area. The last statistic is the potential years of life lost due to preventable disease. The infographic illustrates the difference between food deserts and swamps, and it also demonstrates that low income areas and African Americans are most affected by food deserts/swamps. 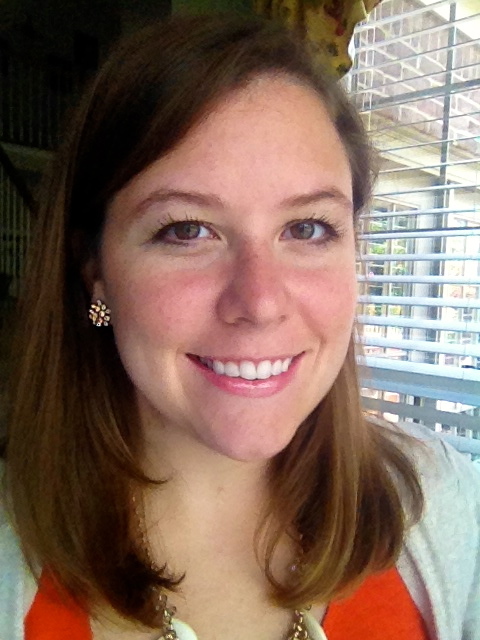 What can we do about food deserts/swamps? The image below lists several strategies to help combat food deserts and swamps. I highlighted a few of the solutions and included examples that have been enacted. Grant funding to get affordable, fresh produce into local convenience stores. 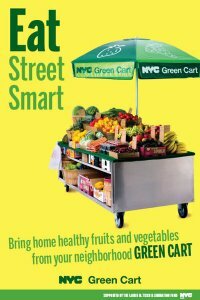 Minneapolis has the Healthy Corner Store Program to assist convenience stores with providing healthier food options. Investment pools to provide grants and loans to grocers wanting to build or expand in underserved neighborhoods. The New Jersey Food Access Initiative is one example. Non-profit grocery stores. Follow this link to see a video about the non-profit grocery store Fare and Square in Chester, Pennsylvania. Volunteer programs that collect unsold food (especially fruits and vegetables) from farmers and food vendors to redistribute to low income communities where fresh food is not readily accessible. One example is Gather Baltimore. Mobile markets and produce vans such as Veggie Van in Durham. 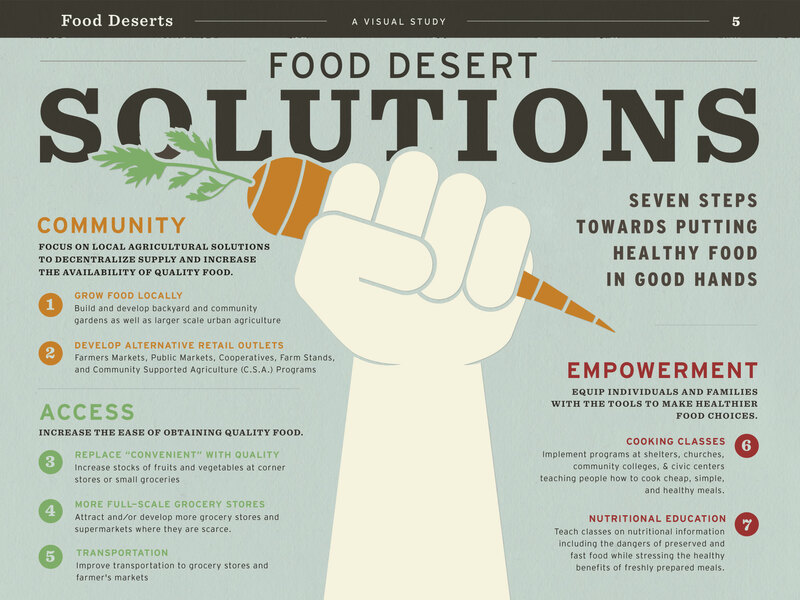 Food Empowerment Project – Great information about food deserts and health risks associated with poor diet.